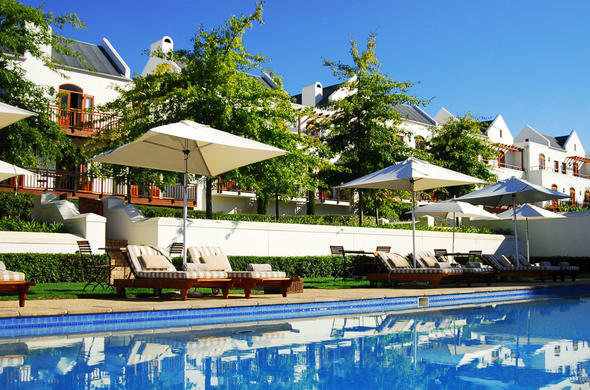 De Zalze Estate (formerly knows as Kleine Zalze) features comprehensive golf facilities, comfortable accommodation, mouth watering cuisine and award winning Kleine Zalze wines. Tucked away under centuries old Oak trees, De Zalze Lodge in the Western Cape offers one far more than panoramic mountain views, vineyards and a world-class golf course. Guests can find luxurious Cape Winelands accommodation at the Klein Zalze Estate is in 47 rooms and suites alongside the De Zalze Golf Course. Your experience in this special place is accompanied by the magnificent restaurant Terroir, featuring seasonal flavours with a local Cape twist, and of course, endless samplings of excellent Kleine Zalze wines from the estate itself. De Zalze Estate is the ideal venue for a productive Cape Winelands conference and unforgettable wedding venue. The Function Venue is equipped with state-of-the-art conference equipment and the kitchen staff is available to cater for the exclusive functions. Gofling enthusiasts are in luck, the estate has a beautiful golf course set amongst working vineyards. The unique Cellar Venue can accommodate weddings and functions for up to 120 people in a stunning Cape Winelands setting, with spectacular views. Tucked away under beautiful centuries old oak trees, De Zalze Lodge offers you panoramic mountain views, overlooking vineyards and a world class golf course.